We head behind the scenes at Handmade Jane and tour Jane's sewing room in London. It's a very light and sunny room, so it's a lovely space to work in. I like the feeling that I'm slightly cut off from the rest of the house. If I have the radio on and I'm immersed in a sewing project, I feel like I'm in my own little world! My sewing room is actually quite a large space - it's located in the converted loft so it's an entire floor of the house. Because it's so large, it has to double up as a guest bedroom. It's also where the main computer is located so it's an office space too. I have two large shelf units to house all my sewing gear and a work table under the roof for my sewing machine and overlocker. The majority of my sewing time is spent dressmaking, but I also make small craft items as occasional commissions. My husband built me two shelf units specifically for my sewing paraphernalia. One is situated above the large desk, so I can see all my patterns, buttons and fabrics as I work. My actual sewing table is situated in a nook under the roof. When I first started working there I banged my head on the roof ALL THE TIME, but I've learnt to duck now! My sewing desk is an original 1950's melamine table with a gingham top. I hunted it down on eBay and absolutely love it. I have a matching fabric pin board above the desk too! All my dressmaking fabric is kept in boxes under the bed. The only fabrics on display are a few piles of quilting cottons on my shelf, which I keep there because they're smaller pieces and they're so colourful and pretty. Any additional patterns and notions that aren't on the main shelf unit are kept in small Ikea boxes. I also keep PDF patterns in folders. All my day-to-day notions (scissors, pins, rulers, tailor's hams etc) are kept in an Ikea Raskog trolley on wheels, which I absolutely love. I don't have to pack things away all the time and I can wheel it to wherever I'm working. I also keep all the elements of the project I'm currently working on in the trolley so I know exactly where they are. I'm a great believer in organising by colour and type - a lot of my buttons are organised by colour and my fabrics are organised by type e.g. knits, lining fabric, polka dots, gingham etc. It's nothing to do with sewing but I LOVE this little Indian elephant. This vintage fashion illustration was given to me by another sewing blogger and is a treasured possession - it's so stylish and elegant! Most of my creations are dressmaking projects for me to wear, so they're not on display in my sewing room. My current project is usually kept on my dressmaker's dummy (Angie) whilst it's still a work in progress. I have a pin board over my sewing desk, which is where I pin fabric swatches, postcards and outfit ideas from magazines. At the moment I'm inspired by lace so that's what's on there. I also love using notebooks! I have one that's full of lists of what I want to sew and how I can fit projects into my schedule. I also have a special Sewist's Notebook called 110 Creations which allows me to keep track of my sewing project by project. This is really useful for seeing what changes I've made to patterns and how I've constructed a garment etc. Reading other sewing blogs are my main source of inspiration. If I see a pattern or a fabric I like, I often have to shamelessly copy it! I'm also a big fan of Pinterest and have lots of sewing boards on there. 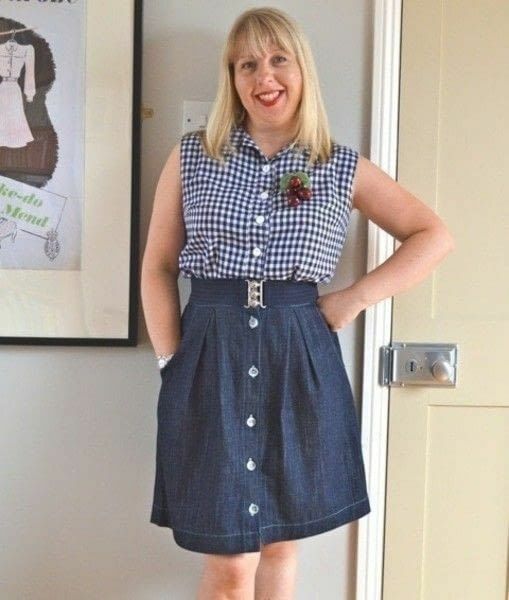 They're organised by colour (red, yellow, green), pattern (gingham, polka dots,stripes) or subject (vintage sewing, tutorials). Sometimes I'll see a look that I just have to recreate or a colour combination I'd never have thought of. I find it endlessly inspiring. I wish the room could be a dedicated sewing room i.e. not have to move out when guests stay! I wish I had a proper cutting table set at the correct height. I wish I had a sewing fairy who could magically sort out all my patterns for me!